TinyCrayon-iOS-SDK – A smart and easy-to-use image masking and cutout SDK for mobile apps. 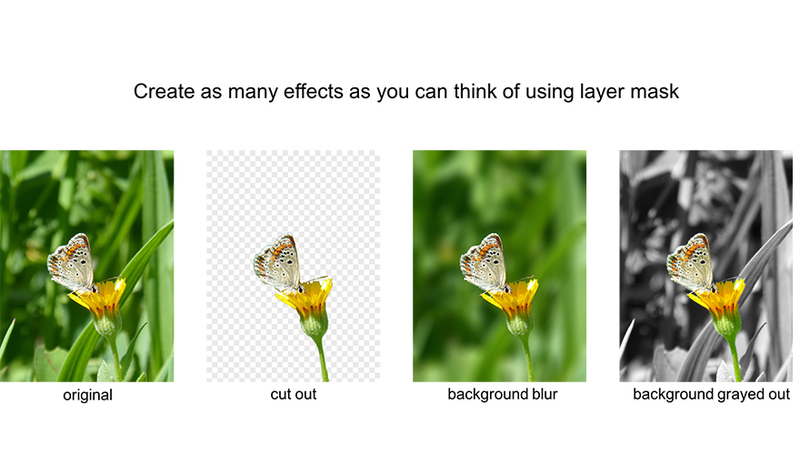 TinyCrayon SDK provides tools for adding image cutout and layer mask capabilities to your mobile applications. Try our sample apps Image Eraser, Color Effect, Focus Effect. Image layer mask is a fundamental technique in image manipulations. It allows you to selectively modify the opacity (transparency) of the layer they belong to. This flexibility to define the opacity of different areas of a layer is the basis for more interesting image manipulation techniques such as selective coloring and luminosity masking. Quick Select: Smart and easy to use, users just need to select part of the object and the edge detection algorithm will find the boundary. Hair Brush: Smooth and natual looking, paint on the hair/fur of an object and the algorithm will select the hair/fur for you in high quality. Regular Brush: A regular brush tool with the capability to adjust its size, hardness and opacity. Free: TinyCrayon SDK is provided under MIT license, you can use it in your commercial applications for free! iPad support: TinyCrayon SDK uses auto layout for its views and adapts to each screen size – iPhone or iPad. Highly customizable: Style the UI, view modes and localized languages as you wish. Swift: Keeping up with time, we chose Swift as the main development language of the TinyCrayon SDK, leading to leaner easier code. Recommended: installation of CocoaPods to simplify dependency management. TinyCrayon SDK is available via CocoaPods. If you’re new to CocoaPods, this Getting Started Guide will help you. CocoaPods is the preferred and simplest way to use the TinyCrayon SDK. Important: Please make sure that you have a CocoaPods version >= 0.39.0 installed. You can check your version of CocoaPods with pod --version. Then run pod install in your project root directory (same directory as your Podfile). If you don’t want to use Cocoapods you can still take advantage of the TinyCrayon SDK by importing the frameworks directly. Download the TinyCrayon SDK zip (this is a ~20MB file and may take some time). Drag TCCore.framework into the Linked Frameworks and Libraries section of your target. Drag TCMask.framework into the Embedded Binaries section of your target. If your project is using Objective-C, set Always Embed Swift Standard Libraries to be YES in your Build Settings. The delegate of the TCMaskView can be used to be notified when the user cancels or completes the edit. In last case the function tcMaskViewDidComplete(mask:image:) is called. data: An array of 8-bits unsigned char, its length is equal to the number of pixels of the image in TCMaskView. Each element in data represents the mask value. size: The size of mask, which is equal to the size of the image in TCMaskView. To try these examples, and find out about more options please take a look at the Examples. Check out TinyCrayon guides and API reference for more details. By using TinyCrayon SDK, you agree to keep the banner ad embedded in TCMaskView fully viewable and clickable to the users. SideMenu - Simple side menu control for iOS in Swift inspired by Facebook.